The Minimalist Minima Photoblog Template. ~ The Blog Doctor. You are here: Home > Template > The Minimalist Minima Photoblog Template. The Minimalist Minima Photoblog Template. The Minima Template or Layout is used whenever you want to customize your blog any which way you want. There are no graphics used in the template as are used in the Rounders template. The Rounders and other templates with graphics are more difficult to customize as the images have to be resized to the new dimension. Here I have attempted to simplify the Minima template further by making it a single-column template. This will enable bloggers to upload large photos or wide videos in their blog without worrying about the sidebar falling down! This is the column containing the posts. If you want you can increase the width further depending on your monitor resolution. (Start button on Windows Taskbar---->Control Panel------>Display Properties----->Settings tab----->Lower left Screen Resolution in pixels). Change 'ffff00' to the hex number of the color you want and save template. You can download the template here. Right click the link and choose "Save Link as" and save the XML template file to your desktop. Then upload template to blog. This is a Layout template and cannot be used if you have a Classic template blog unless you upgrade blog to Layouts. 25 VIEWERS CLICKED HERE TO COMMENT ON THIS POST. ADD YOUR COMMENT. Good advice. One additional input. Instead of playing the "pixel" game - trying converting to "percentage". My blogger templates are set to maximize the screen, regardless of the width each viewer is utilizing. "660px" is changed to "100%", or there about, and whoever views gets to use their entire screen. Not just a narrow 800px strip of blog down the middle. Obviously if you desire to keep the sidebar, then you need to split the 100% (75%-25%) between the main and sidebar. If large margins are desired around the wrapper, the total percentage for the main/side has to drop somewhat (95%-ish). With three columns, you can tailor as required too. Good advice. One additional input. Instead of playing the "pixel" game - try converting to "percentage". My blogger templates are set to maximize the screen, regardless of the width each viewer is utilizing. "660px" is changed to "100%", or there about, and whoever views gets to use their entire screen. Not just a narrow 800px strip of blog down the middle. 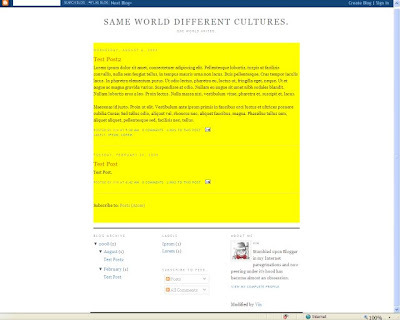 This can be done by loading the Minima Stretch Blogger template and then customizing it as above. All the stretch templates available at Blogger use percentages to maximize the width. I'm looking at my html and looking at your instructions. To me my template looks like what you're telling me to do. I understand having to add to the outer wrapper and about changing the height and width but it already says 660 in the height. Do I add 660 to that to make 1320? Sorry to be so dense. I relly appreciate what you're doing here. Click Preview after every change and save when satisfied. How do I center the header? Have a look at the header tip in this post : 10 Quick Tips for Smarter Blogging. Have a look at How to upload pictures without changing their size? I see the codes, but when you say "paste the second link in code as shown below" what does that exactly mean? First resize image in an image editor to the size you want it to show. Make sure that it is smaller than width of posts column in your blog or it will break the template. Paste the modified code in Edit Html tab of post editor and publish. I finally got the other way o work too (wasn't putting the space b4 the src!) So now I can do it both ways, but wish blogger would make a photoblog template! i'm using this template it's great! but i have just added a blog roll and it pushes the 'view my profile' link and my picture below the bottom black line, is there any way i can lower the black line to underneath my details? is there a way to make the minima stratch template black? See how to change the color of the columns. I'm using Minima stretch lefty , I changed it so that I have the header alligned left, but I want to change the main wrapper (the part with the entry info) to about 3 times the current width so that it creates a horizontal scrolling bar in order to view the photos in the entry horizontally. The main wrapper width is already 67% of total in the stretch template. It cannot be increased beyond 100%. The stretch template resizes according to monitor width. Hence there will be no scrollbar horizontally. Try doing it in a normal Minima template. I want to create an image gallery of my paintings, laid out in table format (three cells wide across the page and however high) with each cell representing one Blog Post (they would get pushed over and down each time I add a new post). Is this something you've seen before or could help me figure out? Can you give address of blog where you have seen this?